This post is a supplement to previous posts covering the series ‘Puella Magi Madoka Magica’. It contains spoilers for the whole series. Earlier posts can be found here, here, here , here and here. What happens after an epilogue? I’ll make the very brave assumption that the majority of people reading this have also read, at some point, the Harry Potter series. Statistically, there’s a very good chance that you have, anyway. When you read/saw that surprisingly controversial epilogue, did the characters live on in your head? There are two trains of thought on this, really: the first is that the story ends where its canon does – anything that the reader is not told, didn’t necessarily happen; the second is that the story goes on, regardless of whether or not it is told to the readers. For the purpose of this post, which will serve to wrap up this series on Puella Magi Madoka Magica, we will be looking at the second version. Unlike the previous posts, this particular one will not in the play-by-play style of its predecessors, primarily because Rebellion (what you thought I was going to type the whole thing out each time?) is dense and complex. It is one of those movies in which what happens is curiously less important than how it affects the status quo, largely because of the characters’ powers to re-write what has happened. I will admit, I found the choice of Homura as the central character for this movie to be surprising but now that I think about it, I don’t know why. Homura was a pivotal character in the series and arguably, played a more central role than Madoka herself until the very end. What this movie drove home however, was how little we have seen from Homura’s perspective. Episode 11 of the series was devoted to her, of course, but beyond that, we haven’t seen much of her. My response to the movie’s treatment of her character has gone through a shift over time – partially as I tried to explain my emotional responses and questioned what was driving them. My first impression was that this movie ended up undoing a great deal of the what the series established. I had thought that the series had ended on a perfect note – or as close to one as I could imagine – with Madoka achieving a selfless immortality that was in line with her own kind character and the promises of her power that the series built up. Homura too got the closure that the character deserved – she fulfilled her promise to her best friend (though really, friend seems woefully inadequate to describe Homura’s feelings for Madoka) and could rest easy knowing that Madoka had achieved her own goals and purpose. It wasn’t a perfectly happy ending but it was a greatly fulfilling one and I enjoyed it. Rebellion really upset the apple cart in that regard. It undoes a great deal of closure that the original ending offered and it was not clear to me what exactly the audience was being offered in return for that disturbance. I’ll leave my final impression of the movie for the end of this post, where it will hopefully make sense as a culmination of the rest of the points I’ll be discussing. Rebellion asks us the question, ‘wouldn’t it be better if none of this ever happened?’ The movie opens and ends with alternate versions of events from the first episode of the series. In the opening scene, Rebellion doesn’t hesitate to stick the knife deep and heart into the audience’s hearts; we all know very early on that this cute and sweet set-up is neither real nor going to last for very long. Watching the characters get along and united picks at the heart-strings; it’s not unlike a similar scene in Neon Genesis Evangelion where the characters are normal well-adjusted children, just for a minute. This question of how things could have been, had things played out differently, feels like the perfect question for a character like Homura, whose powers revolve around time. As I mentioned earlier, my response to this was – why? What was so wrong about the way that things turned out the last time? The answer lies deep in the psyche of Akemi Homura. For the first half of the movie, Homura plays the role of the protagonist and the last sane person in a world that has gone wrong but doesn’t even know it. She is the only person who’s fully woke and aware of the contradictions in the world around, especially since she is technically the only person who can remember the events of the final episode. It raises that endless fascinating question of whether something really happened if you’re the only person who can remember it – and if a supernatural divine power literally changed the flow of time and events such that your memories never happened? The events of Rebellion are a dangerous mixture of unhappy coincidences, natural consequences and malicious intents. Homura’s memories isolate her; in a world where only she can remember Madoka and her ascension to divinity, the rest of the world unsurprisingly believes her insane, to the point that Homura herself begins to question her sanity. These are the natural consequences to the solution explored at the end of the series. However, through malicious intent and unhappy coincidence, the Incubators are able to trap Homura in an isolation field when she is on the verge of giving in to the despair that would otherwise turn magical girls into Witches. Homura sort of turns, sort of doesn’t and Madoka and the rest of gang infiltrate the fields – lured in by the Incubators who used Homura as bait – to rescue Homura from her own despair. So far so good. I think it is a refreshing change to see Homura, who’s always had all the cards in her hand, be on the other side and genuinely need help (though, yes, it did also happen in the final episode of the series) and the revelation of Homura’s descent to Witchhood (is that a word?) was well done. After that, however, I think the story starts to take a turn and it took me a while to decide if that turn was a turn for the better or worse. My decision centers on how to respond to the change in the role that Homura plays. She shifts from being a traditional protagonist to being more of a sympathetic anti-hero, or depending on how generous you want to be, a sympathetic antagonist. I don’t think the degree of sympathy really changes; most viewers would agree that Homura has suffered a great deal and whether you see her decisions at the end of the movie as misguided but well-intentioned or self-serving and indulgent really depends on your own personal philosophy when it comes to matters like personal liberty and the nature of happiness. Personally, my first response was confusion. I thought either I had totally misunderstood Homura’s character during the series or that the movie had somehow shown a change in her character that I had somehow missed. As I reflected, I realized the truth lay elsewhere. I think the movie is showing us a new side of Homura, one that we didn’t really need to see during the series. 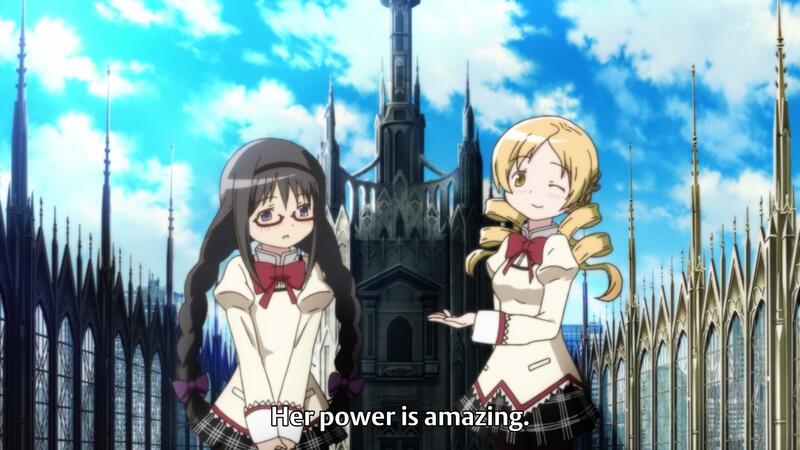 Homura’s love for Madoka in the series was portrayed as pure and good because it was meant to save Madoka from the pains of becoming a magical girl and eventually, a Witch. 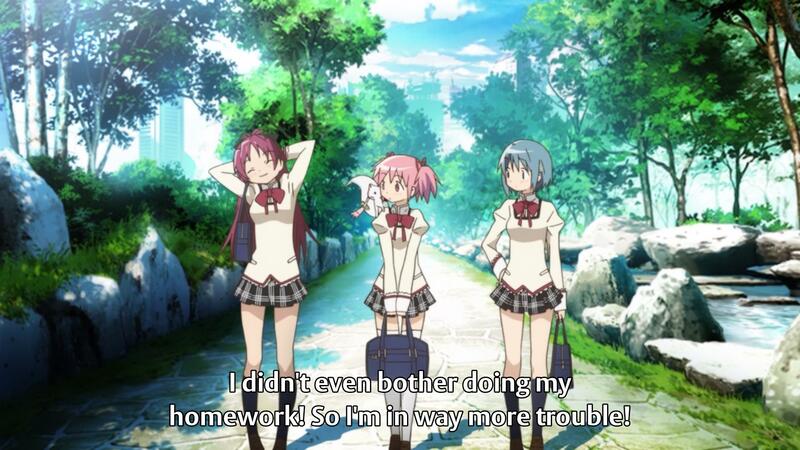 However, when the series ended, Homura’s love for Madoka, it seems, did not have the same closure. The contrast between Madoka’s selfless, all encompassing love and Homura’s selfish, Madoka-specific love is an interesting one and I think, personally, it’s what turned my opinion on the movie around. Homura’s turn to darkness is out of character and ruins the character as established by the series. I can certainly make a case for this, even though it is not what I personally believe. 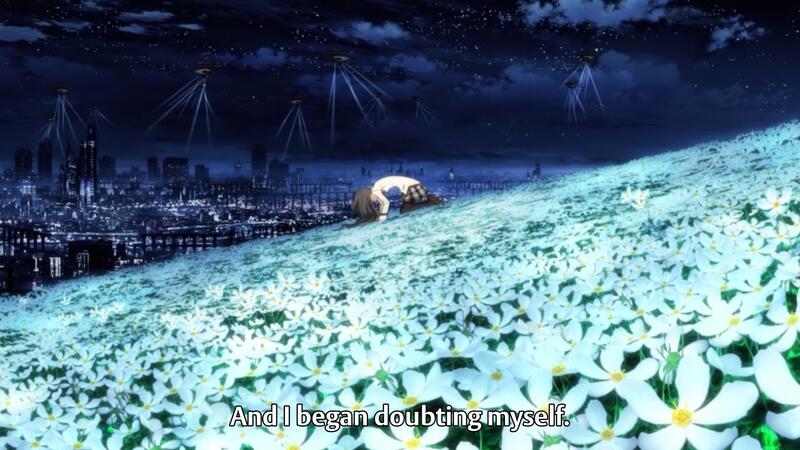 Homura, in the series, fought endlessly for what was effectively years in cumulative time, to save Madoka. Her character earned a break and denying the character that in a supplementary material like a movie seems cruel and unnecessary. Furthermore, Homura seemed to have accepted the way things ended at the end of the series, why should she despair when she knows that she’s the only one who would remember Madoka and her sacrifice? Why not just let Homura end on a heroic note instead of tainting her legacy like this? In a nutshell then, the above captures my emotional responses to Rebellion. A few miscellaneous notes before we wrap this up. One of the things I enjoyed about this movie was how it felt like a continuation of the final episodes. Now, that might sound really obvious – why wouldn’t it be – but I mean that I got the sense that movie benefited greatly from the ability to explore the series’ universe and its themes much more openly and in greater depth than in the series itself. I expect a great deal of that is because in the series, especially the first half, the audience was kept in suspect about the true nature of the universe’s reality, but in Rebellion now that the audience knows as much as the characters, there is no need for the cloak and dagger narration of the first three quarters of the series. As such, even the intensity, pacing and narrative style of Rebellion picks up where the series left off, resulting a film that is more contemplative, reflective and thematically driven than focused on specific events and occurrences. The animation itself was obviously also a good step up from the series, I thought – the fight scene between Mami and Homura was great and in general the action was pretty well done, though the truth is, a lot of the time, I was waiting for them to get over with it so I could see what happens next. I didn’t really think that any of the major characters were ever at risk of dying to a random mook. My final verdict on Rebellion is that it provides an alternative ending to the series for those who choose to accept it as such. I do think it is a little more complicated as an ending than the original – which shouldn’t be very surprising given that it builds on top of the original – but is equally bittersweet just at a different character’s expense. Both endings don’t leave the audience feeling like things were left hanging and while I enjoyed this ending on its own merits, I think in my head, the original ending is the one that I will be sticking with. In the future, I think a re-watch of the series – maybe via the first two movies – could be interesting, just to see all the things I missed. Alright, as for the upcoming schedules – now that I’m done with this series, the hunt for the next series continue. Until next week, I’ll consider any series put in the comments though my next target is going to be to tackle Season 7 of Game of Thrones along with some books that I’ve been reading but haven’t gotten around to reviewing just yet. 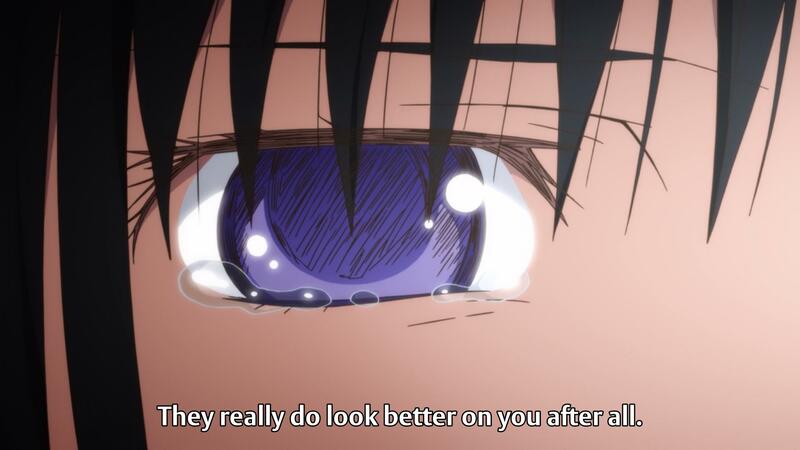 If you dont have a problem with ”long” series i would recommend Fullmetal Alchemist: Brotherhood. It is one of the most recommended series i’ve seen but i was ignoring it for a long time because of how long it is but after i’ve watched it, it became one of my favorite series along with steins;gate and fate/zero.You should at least watch three episodes to see if it catches your interest. If you think about it, everything in the movie leading up to the ending is essentially a character analysis of Homura. We see everything there is to see about her that is relevant to her character. We get her ideal world in the beginning, where everyone is living and working peacefully together with no worries about corrupt soul gems or major personal drama. Then throughout the movie we see her strengths and weaknesses, and of course what, or rather who, is most important to her. It really makes sense to view it that way when you factor in that all of it taking place inside her soul gem is the perfect allegory for soul searching/self-reflection. One criticism I’ve seen of Rebellion is that Homura’s new form is not properly explained, which I’m kind of surprised you didn’t touch on at all. What I’ve found regarding this issue though, is that the movie explains it through context rather than overtly telling us what happened. “As you are now you wouldn’t know this, but I became a magical girl solely to save Madoka”. It’s shortly after Homura says this to Kyubey that she starts purposely trying to become a witch for that very same reason. In episode twelve, Madoka could be seen carrying out the result of her wish as a normal magical girl, but the moment she faced off against her own witch is when she took on her new form as the goddess. It seems to me that existing as both a magical girl and a witch simultaneously created a paradox, which is what forced her out of the material universe and into a higher dimension. Homura did something similar, except that instead of causing a paradox in space/time, the paradox was in her soul, because both her hope and despair were bound to another emotion, that being love. As a result, Homura’s soul took on an entirely new form, which is called the dark orb, and she became what she refers to as a demon. I’ve never really understood this viewpoint that Rebellion “ruins Homura’s character”. I think that viewpoint ignores too much of what we saw of Homura in the series. The series made it pretty clear that protecting Madoka is Homura’s one and only reason for living, so to say she could just drop that and move on would be quite a stretch from my perspective. I think the series further cements this with Homura’s monologue in the epilogue: “This world isn’t worth saving, but it’s a place she once tried to protect. That’s why I still fight.” These words pretty clearly state that Homura is still relying on Madoka to keep going, even if she isn’t right there in front of her. Personally, I never saw any sort of conflict with Homura’s character when I watched Rebellion the first time, because to me it felt like the natural course for her character to take. 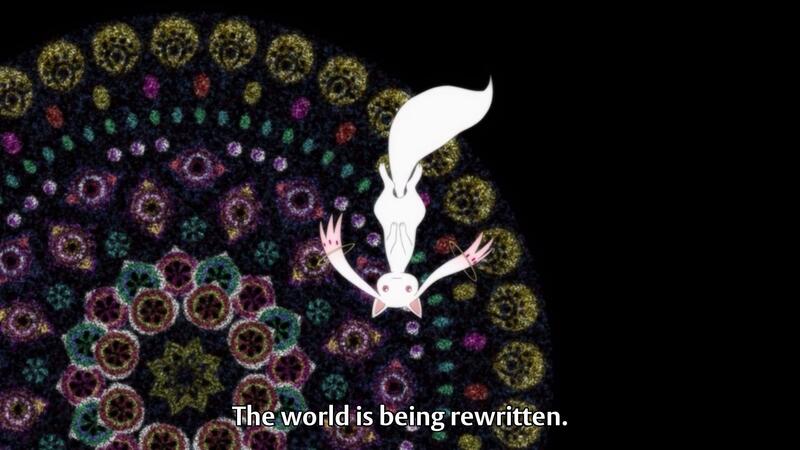 As for Homura “rewriting” the universe, I don’t really think that’s quite an accurate description, despite that being how Kyubey described it. Going off of the visuals, it looks more to me like Homura was generating an enormous labyrinth, big enough to encompass the entire universe. This seems to be backed up by the various sightings of freely roaming familiars we see post-transformation. The labyrinth itself seems to only serve one purpose, and that is to keep Madoka from reconnecting with the goddess, though that seems to be tenuous at best. The recap movies are definitely worth watching once you know the story. The updated visuals and new soundtracks alone make it worth it in my opinion, but I also really liked the way certain scenes were re-worked, and there were also new details added in, particularly in the second movie. As for recommendations for your next project, I’d suggest either Steins;Gate, Re:Zero, Erased or Psycho-Pass. The first three are series that contain time travel elements and the fourth is another Urobuchi work, about a dystopian Japan which is run by something called the Sybil system. Erased is a thriller, where the main character has to figure out who killed his mother and tried to frame him. It’s the shortest of my recommendations at only twelve episodes. Steins;Gate basically centers around time travel. The main cast accidentally finds out that they can send text messages to the past, which gets them caught up in a massive conspiracy involving Sern (that’s how it’s spelled in the series). Time travel is a major part of the plot in this series, and it really goes in depth by mentioning various time travel theories while presenting its own. 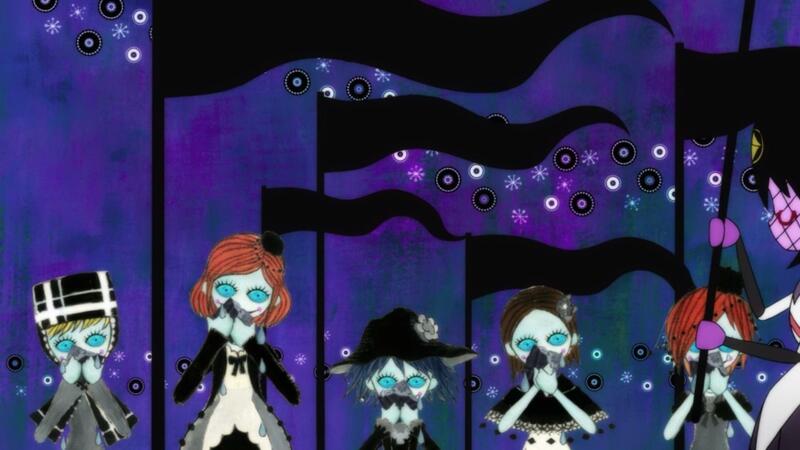 This series in particular is an adaptation of a multi-route visual novel by the same name. Re:Zero is the type of series where the main character gets trapped in a fantasy style alternate world, but in this case he discovers he has the power to “return by death”, where every time he dies he is sent back in time.